Most of the business of a river is conducted through its channel. The day-to-day task of handling discharge, the year-to-year task of eroding, transporting, and depositing sediment, and the long-term adjustments toward some equilibrium are all dependent on processes that occur within or immediately adjacent to a river's main channel. The morphology and behavior of channels has long been considered a sensitive indicator of the "state" of any river as well as a record of processes acting within a watershed. For much of this century geomorphologists have been measuring and analyzing river channels in order to tie them in some predictable way to aspects of the hydrology and geology of their watersheds. For every study conducted, it seems there is a new set of equations (with fudge factors) that quantify these relationships. The scatter in the data is immense, the usefulness of the results suspect. What has emerged from these studies is the recognition that there are broadly applicable principles that govern the response of river channels to change within, or differences between, watersheds. Although it is difficult to predict the precise extent of the change, the nature of change can be estimated. The qualitative associations between river morphology and hydrology are explored in this chapter, with an emphasis on the response of rivers to changes in watershed conditions. A river balances and minimizes its energy expenditures through adjustment of its channel cross section. Along the entire length of a river the shape and size of an infinite number of cross sections are in constant vari-ation, adapting to the discharge and sediment load that is delivered to it by the channel reach that lies immediately upstream. In aggregate these adjustments produce the distinctive channel patterns that record the establishment of dynamic equilibrium within the overall river system. Rivers construct channel cross sections that are best adapted for the wide range of discharges delivered by their watersheds. It is clear from the all-too-common flooding of some regions in California that rivers do not form channels capable of containing the entire range of flows. This is somewhat counterintuitive, since most of the work that a river does takes place during infrequent runoff events. It seems logical to assume that these highly competent, rare large flows should scour large channels that are capable of accommodating all of the discharge without creating any flooding. Conversely, most of the time it appears that channels are, in fact, overdesigned for their discharge. During the major part of any given year, the flows that move through rivers do not come close to taxing even half the channel capacity. These common flows have such low overall stream power that they are incapable of eroding and transporting much sediment. Thus they exert little influence on the configuration of the channel. A number of workers have noted that although unusually large discharge events are capable of greatly affecting river channels and river geomorphology, their occurrence is so rare that, when viewed in the long term, their effects are usually masked by intermediate, more frequent discharges. The ability of intermediate flows to erode, transport, and deposit sediment allows them to eventually undo the effects of the larger events and to control the equilibrium configuration of the channels. The intermediate discharge that appears to exert the greatest influence on the shape and size of channel cross sections and thus on the overall geomorphology of the river is generally known as bankfull stage or bankfull discharge. For most rivers, bankfull stage occurs when discharge fills the entire channel cross section without significant inundation of the adjacent floodplain. Bankfull stage or bankfull discharge, Qb, usually occurs with a frequency of 1.5 to 2 years for natural, undammed rivers. This does not mean that these flows will occur like clockwork every two years. Rather, over very long periods, bankfull discharge will occur on average every 1.5 to 2 years (see discussion of flood frequency, chap. 14). Apparently, bankfull discharges meet two key criteria for shaping channel cross section: (1) the flows contain sufficient stream power to erode bank materials and to transport and deposit large volumes of sediment; and (2) they occur often enough that their effects are not muted by the weaker, but higher-frequency, smaller-discharge events. The interaction between bankfull discharge and its channel produces a wide range of channel cross sections. The causes of these variations are numerous but are usually tied directly to interaction between the flow and the bank materials. Within any given channel reach, the cross-sectional profile of the river varies from symmetric to asymmetric (fig. 4.1). This variation is due primarily to the tendency of a river to develop meanders rather than a perfectly straight channel (discussed below). Within meander bends that are tightly curved, the cross-section profile becomes strongly asymmetric. In the relatively straight stretches between meander bends, the profiles are more symmetric. Disruptions in the overall pro-file shape are typically associated with obstructions or the development of channel bars. The shape of a channel controls the structure of the flow that travels through it (and vice versa). Bed shear stress, the necessary ingredient for entrainment of sediment, is proportional to the velocity gradient (change in velocity with distance from the bed). In symmetric channels, the highest flow velocities and highest velocity gradients are located near the center of the channel, with the lowest gradients occurring near the margins. In contrast, in asymmetric channels, the velocities and gradients are always located adjacent to the steep-walled cut banks. During bankfull stage, the differences in distribution of bed shear stresses within symmetric and asymmetric channels control the style and magnitude of channel cross-section modification. The concentration of bed shear stress along the cut bank margin of asymmetric channels will cause them to erode the channel wall and expand laterally, whereas the concentration of bed shear stress in the center of symmetric channels will cause them to incise or deepen. To maintain continuity of flow during bankfull discharge (Q = vA), increases in channel cross section associated with erosion must be balanced by either a decrease in the velocity of the flow or by compensating deposition and reduction in cross-sectional area elsewhere in the channel. In symmetric channels, this deposition usually takes place in channel bars or along the margins. In asymmetric channels, deposition is usually restricted to the low-velocity margin of the channel opposite the most intense erosion. The balance between erosion on one side of a channel and deposition on the opposite side is the driving force behind lateral migration of channels (see discussion below). Where channel reaches inundate their floodplains with a frequency greater than the 1.5 to 2 years typical of bankfull stage, depositional processes, rather than erosional processes, can act to expand the channel capacity. Discharge that is fully confined to a channel maintains high competence. When discharge exceeds channel capacity, there is a dramatic increase in cross-sectional area associated with expansion onto the floodplain (fig. 4.2). The velocity and depth of water flowing outside of the channel declines rapidly with distance away from the channel. The decline in depth and velocity, which produces sharp drops in Re and Fr values, produces a rapid loss in stream power and competence. This decline acts to hydraulically segregate and deposit material that was formerly in suspension within the channel. The coarsest sediment (usually fine sand and silt) undergoes rapid deposition immediately adjacent to the channel, while the finest sediment is deposited away from the channel out on the floodplain. This is why Californians are always scraping mud, rather than sand, out of their homes after floods. Multiple flooding constructs a berm or levee adjacent to the active channel. As these levees increase in height the channel capacity increases, allowing the channel to contain larger and larger discharges. Fig. 4.2. Construction of natural levees. Rapid decline in competence of flows that occur outside of channel causes localized deposition of coarse material immediately adjacent to river. Multiple flooding episodes cause the levees to grow, increasing the overall channel capacity. Since a river adjusts to handle its load and discharge, it is logical to assume that the geometry and size of a channel cross section are controlled solely by these factors. However, another important control on channel morphology is the nature of bed and bank materials in which a river establishes itself. Where rivers traverse valleys filled with alluvium, the cohesiveness of the sediment and its resistance to erosion will greatly influence the shape of a channel and, ultimately, the behavior of flow within it. Where bank materials are soft and easily erodible, scour of the banks causes channels to expand laterally, forming cross sections that are wide and shallow. Where channel margins are resistant to erosion, there is a tendency for cross sections to become narrower, with steeper banks. The resistance of alluvial bank materials is dependent on a variety of factors. Finer-grained materials, like clays and muds, tend to be more cohesive and resistant to erosion. In addition, the degree of cementation and consolidation of sediments will dictate their resistance. However, one of the most important factors controlling cross-section geometry in alluvial rivers is the presence and type of bank-stabilizing vegetation. The role of riparian vegetation in shaping channel cross sections is usually underappreciated. The mesh-work of roots from trees and the diverse riparian vegetation that are directly dependent on river water can, in many cases, be as effective in stabilizing riverbanks as the scenic concrete and riprap liners that are the preferred fare of the U.S. Army Corps of Engineers (chap. 15). As channels migrate laterally within alluvial valleys, they erode their own floodplain as well as channel deposits left behind by previous lateral migrations. In this way, they usually erode material that is compositionally similar to the load being supplied by the watershed. At the same time, the channel and overbank deposits that are accumulating at present in a river will be the bank materials of the near future as the channel migrates back and forth. For this reason, rivers with high suspended load/bedload ratios tend to have erosionally resistant banks composed of silt and clay. This resistance typically leads to the development of steep-sided, narrow channels that are, in an illustration of the complex circularity of feedback within these systems, ideal for transporting high suspended sediment loads. Rivers that are dominated by bedload tend to have less-resistant banks composed of sand and, to a lesser extent, gravels. These channels are more likely to be broad and shallow as well as highly unstable. The increase in wetted perimeter of these channels makes them ideal for transporting coarse bedload. In upland regions where rivers are actively cutting into bedrock, the bank materials are an independent influence on channel geometry. The erosional resistance of the bedrock and the regional rates of uplift will typically dictate the channel geometry. Where the channel is fully contained within a resistant bedrock unit, the shape will be narrow and deep, whereas erodible bedrock will typically produce broad, shallow channels. Where incising channels encounter an erosionally resistant layer of bedrock, they will initially expand laterally faster than they incise. When they are fully contained within the underlying resistant bedrock, they will re-establish a narrow, deep channel. In areas where uplift rates are high, steep-walled narrow channel cross sections will typically reflect rapid rates of incision, regardless of bedrock type. Like a two-year-old child, a river cannot hold still. The innumerable and incessant adjustments that occur in a channel cross section translate to constant change in channel pattern and character. Since most unregulated rivers achieve dynamic equilibrium, this change can occur at various scales, ranging from incremental lateral migration to dramatic channel abandonment and switching. The reasons behind this incessant motion are among the more puzzling aspects of rivers and have given rise to numerous innovative and clever hypotheses and some enjoyable philosophical arguments. Regardless of the causes of this mobility (explored below), it is fundamental to all rivers and is the root of most morphologic classification schemes. River and stream channel patterns can be grouped into two general classes: single channel and multichannel. The flow in single channel rivers is restricted to a discrete, sinuous channel. The larger rivers of California, like the San Joaquin, Sacramento (fig. 4.3), and Klamath, all occupy one relatively stable main channel surrounded by an extensive floodplain. Multichannel rivers, like the Santa Ana, Santa Clara, and Santa Maria and many of the small rivers and creeks that emerge from dry, steep mountain ranges (fig. 4.4), consist of numerous, unstable channels that bifurcate and join across a relatively broad wash. The differences between single and multichannel rivers reflect contrasting watershed conditions. Fig. 4.3. 1952 aerial photograph of Sacramento River in Glenn County, north of Sacramento. Note meandering single channel pattern of river. Also note extensive point bar development and heavily vegetated riparian corridor. Fig. 4.4. 1953 USDA aerial photograph of lower Cache Creek, Yolo County, California. This steep-gradient, bedload-dominated river occupies multiple, actively migrating channels during bankfull discharge events, forming an extensive braid plain. Intense aggregate mining has greatly disrupted the sediment budget for this river, creating a number of land use issues. Fig. 4.5. Confluence of the Merced and San Joaquin rivers illustrating meander and point bar development. Note numerous abandoned channels and meander cutoffs on floodplain. Also note difference in meander wavelength and amplitude of the San Joaquin above and below confluence. Change in meandering is probably associated with addition of discharge from the Merced River. Fig. 4.6. Meandering river depicting some of the main physiographic features used for describing sinuosity in single channel rivers. L refers to the meander wavelength. The latter sinuosity index has been used to separate single channel rivers into three general classes: straight (SI < 1.05), sinuous (SI 1.05-1.5), and meandering (SI > 1.5) (fig. 4.7). The scarcity of perfectly "straight" channels is widely believed to indicate that meandering is the more preferred state of single channel rivers. Why rivers prefer to meander is subject to debate. In general, the arguments revolve around the view that meandering is a response to either external forcing mechanisms, such as discharge and sediment supply, or internal mechanisms, such as flow separation and the development of vortices. The "extrinsic" view of meandering proposes that the sinuosity reflects the efforts of a river to maintain energy efficiency while balancing energy or power expenditures throughout its length. The "intrinsic" view argues that meandering occurs whenever local perturbations in erosional resistance of bed or bank materials occur. These differences cause a deviation in the flow path that is self-accelerating and translated downstream. In essence, single channel rivers cannot help it; they have to meander. The meandering of single channel rivers probably reflects both intrinsic and extrinsic processes. The wavelength and amplitude of meanders within rivers are clearly nonrandom. They can be correlated with aspects of the overall load, discharge, and gradient with which any stretch of a river has to work. Thus meandering must be associated with a river's attempt to handle its load and balance its energy expenditures. However, all of these adjustments in energy expenditures and load transport are in tiated by the natural tendency of flow to be deflected or diverted by inhomogeneities in bank and bed materials. That is, channels actively seek to develop an asymmetric profile, which, in turn, forces a river to develop meanders. In this manner, extrinsic and intrinsic processes work in concert to produce meandering rivers. The intrinsic causes of meandering are the most extensively studied and the most easily recognized along any river. The "urge" to meander involves interaction between sediments that make up the bed and bank material and the oscillatory nature of flow within a channel. The longitudinal bed profile of most rivers and streams is broken into a series of alternating segments of high and low gradient. These segments form the riffles and pools, respectively, that are evident at low water levels (fig. 4.1). Riffles are the topographic high points on a bed profile. They are typically spaced five to seven channel widths apart and are composed of the coarsest bed-load that is being transported by the river. Pools, the haven of most river fish, are deep-water areas between the riffles. During high flow events, the pools are usually scoured, leaving a coarse gravel lag or channel armor and depositing material on the riffles. Riffles and pools are a product of secondary circulation within channels. Turbulence induced by boundary roughness and interaction of the flow with any irregularities within channels sets up multiple secondary flow cells, or flow that moves downstream in a cylindrical, spiral motion. When secondary flow cells converge in the middle of a channel, there is a tendency for the flow to scour and form pools. Where the flow cells diverge, there is a tendency for the stream to erode its banks and build bars or riffles in the middle of the channel. Once established in a channel, riffles and pools create even further disruptions in the uniformity of river flow. In low-gradient, low-sinuosity rivers (SI \ 1.05) the overall stream power is usually low. Thus, although the riffles and pools create further flow disruptions, there is little erosion of the banks and the channel remains relatively static (an unusual case). Where stream power is great enough to erode bank materials, deflection of secondary flow cells will induce bank erosion and initiate the formation of meander bends (fig. 4.8). Once begun, the growth of meander bends is self-driven. As most rafters, canoeists, and kayakers know, as water runs into a tight meander bend it appears to pile up against the cut bank. Termed superelevation, this water creates a hydraulic head that sets up a strong secondary flow cell within the meander bend. Water within the flow cell plunges downward along the outside of the meander bend, crossing along the bottom and then upward into the other bank before flowing back toward the cut bank. The intense secondary flow cell created by superelevation acts to accelerate erosion of the bank and the bed on the outside of the meander. This, in conjunction with the high-velocity gradients that naturally occur on the steep sides of asymmetric channel (fig. 4.1), hastens the lateral growth of the meander bend. The growth of a meander is not restricted to erosion along the outside of the meander bend. Left uncompensated, this increased widening of the channel would lead to a decline in velocity and a cessation of erosion. The rate of lateral migration of the outside wall of a meander is usually matched by deposition of material on the opposite bank, allowing the channel width to remain relatively constant during lateral movement. This deposition forms the prominent sedimentary feature of all meandering rivers: the point bar (figs. 4.3, 4.9). Fig. 4.9. Diagram illustrating the major geomorphic and sedimentary features of a meandering, single channel river. All of these features can be seen in aerial photographs shown in figs. 4.3 and 4.11. Note lateral growth or accretion of point bar deposits. Growth of point bar compensates erosion along cut bank, maintaining overall channel cross section and flow competence. Bed shear stress on a point bar varies depending on the water level. Overall, the sediments of a point bar indicate a gradual decline in velocity and bed shear stress from the base of the point bar to the top. The secondary flow cell that scours the cut bank and channel base moves sediment from the scour channel up the face of the point bar. As these currents move up the bar and lose velocity, they lose competence. Thus at any given time there is a segregation of grain sizes on the point bar, with the coarsest material moving near the base of the bar and the finer material moving near the top. As meander bends migrate, compensatory lateral growth of the point bar deposit occurs through accretion or deposition of sediment. The grain segregation that occurs on the face of the bar is reflected in the sediments that accumulate. When excavated, point bar deposits will typically be graded, consisting of coarse gravel deposits at the base (scour channel) overlain by stratified coarse sand (lower point bar) that grade into laminated fine sands (upper point bar). The point bar is typically capped by organic-rich silt and clay of overbank or floodplain deposits. Although meander growth seems like a unidirectional process that should lead to ever-increasing meander amplitudes, it clearly is not. First, meanders can only expand to the width of their valleys before encountering more resistant bedrock. Second, meander growth is often disrupted by channel abandonment. A variety of factors can conspire to lead to the abandonment of meander bends or even wholesale abandonment of meander belts. Downstream as well as lateral expansion of meanders will eventually cause meander channels to intersect, temporarily reestablishing a shorter and straighter channel and cutting off the channel that originally made up the large meander bend (figs. 4.10, 4.11A, B). Where both ends of these abandoned meander channels are cut off from the newly established channels, they form horseshoe-shaped lakes, known as oxbow lakes. These lakes become the sites of accumulation of fine overbank sediments and vast quantities of organic material such as peat. When the lakes fill with sediment, they commonly become swamps or wetlands. If one end of the abandoned meander continues to receive flow directly from the channel, sloughs are formed. These, too, eventually fill with sediment but are less likely to accumulate large quantities of peat. A second and perhaps more common cause of abandonment of meanders is associated with the development of cutoffs. During flooding events, flow across the inside of the point bar can establish chutes or channels. Intense scouring of these chutes can lead to the establishment of a new channel across the point bar and abandonment of the meander. Fig. 4.10. Development of meander cutoffs. Lateral expansion of meanders can lead to development of neck cutoffs. Development of point bar chutes during flooding can also lead to cutoff (see fig. 4.11). Fig. 4.11A. 1952 USDA aerial photographs used for crop surveys illustrating channel evolution of Sacramento River, Glenn and Colusa counties. Above: Flow across surface of point bar leading to development of cutoff in meander bend during moderate discharge event. Fig. 4.11B. Above: Recent episode of channel straightening through neck cutoff has led to development of multiple oxbow lakes. Channel straightening may be associated with flow regulation due to Shasta Dam. The tendency for deposition during overbank flooding events to be concentrated near the river can, in the long term, lead to a buildup of the meander belt itself. In portions of the Sacramento Valley, the meander belt axis actually sits at a higher elevation than the surrounding floodplain. During very large floods, a river will occasionally abandon its meander belt entirely and establish a new channel in the surrounding lower-lying areas of the valley. Termed avulsion, large-scale channel abandonment is a common feature of most large and intermediate river systems (fig. 4.12). Avulsion is unlikely to occur in the near future in the Sacramento Valley because of the extensive network of levees and bypass systems that control flooding. Fig. 4.12. Avulsion of Owens River below Owens River Gorge. Sharp decline in gradient of Owens River as it enters Owens Valley has led to multiple episodes of avulsion. Note complete abandonment of channel and meander belt axis and establishment of new meander belt. Photograph by author. This strong correlation of width to meander wavelength reflects the role of secondary circulation cells in negative feedback with channel size. As shown above, channel size and shape are primarily a function of the interaction of discharge, sediment load, and bank material properties. By controlling channel width and depth, these features influence the formation and wavelength of secondary flow cells. Convergence and divergence of these cells leads to the formation of riffle-pool sequences. In rivers with sufficient stream power, these riffle-pool sequences initiate bank erosion and the development of meander bends. Again, the feedback within these systems cannot be overstated; changes in one characteristic translate quickly to numerous others, which, in turn, affect the original character. When asked to define a river, most people describe a single channel that meanders across the landscape. Yet many of the world's great rivers and a significant portion of California's rivers do not occupy a single, sinuous channel. During moderate to high discharge events, these braided rivers establish multiple channels that repeatedly diverge and join (figs. 4.4, 4.13). Fig. 4.13. Pipes Wash in Homestead Valley, southern California, illustrating multiple active and inactive channels and interchannel bars or islands of a typical semiarid, braided, multichannel river. To an engineer, the braided river must appear to be the utmost in inefficiency. By creating multiple channels instead of one single channel, the river increases the effectiveness of bed roughness by increasing the total wetted perimeter. To exacerbate this apparent error in design, braided river channel cross sections are typically broad and shallow with numerous sand and gravel bars that further increase bed roughness. The extrinsic view of meandering rivers argues that meander development reflects a river's attempt to maintain energy efficiency while balancing energy expenditures throughout. Ideally, the blatant inefficiency of a braided river might also be viewed in a similar manner. The creation of multiple, shallow channels with coarse sediment load acts to increase energy expenditures, effectively dissipating excess energy. It should be no surprise, therefore, that braided rivers are generally favored in settings with steep gradients, highly variable discharges, and abundant coarse load. An important characteristic of braided rivers is the instability of their channels. Channel abandonment can occur on time scales varying from hours to months and can involve either gradual or sudden changes. The reason for the dynamic nature of braided river channels is rooted in their varying discharge, overall coarse sediment load, and unstable bank materials. During rapidly rising river stage, secondary circulation cells that form within channels quickly increase in intensity. As shown above, divergent flow cells cause the coarsest material being transported to accumulate within the center of the channel. In coarse bedload systems, these accumulations initiate the formation, growth, and downstream migration of channel bars. As a channel bar grows, it deforms or splits the flow, increasing bed shear stresses in channels or chutes on either side of the bar. Because the river is bedload dominated, the bank materials tend to be relatively coarse-grained and erosionally nonresistant. In addition, most braided rivers in California are formed in semiarid settings where little riparian vegetation protects banks. The nonresistant banks of braided rivers allow rapid lateral expansion of channel bars and erosion of the banks as bars grow and propagate downstream. The growth of these bars during floods leads to the establishment of numerous islands that split the channel into multiple individual channels that branch and rejoin frequently (figs. 4.13, 4.14). Fig. 4.14. Model braided river system illustrating principal geomorphic and depositional features. Note development of intrachannel bars and islands. Growth of bars promotes development of multiple channels during rising flood stage. The shape and size of the bars that form in braided rivers is highly variable. In coarse-grained bedload rivers, the bars will typically align their long axis parallel to the current. Known as longitudinal bars, they migrate by erosion on the upstream side and accretion on the top and downstream sides in a manner analogous to the growth of ripples. Indeed, many have argued that the active channel bars of rivers are nothing more than large-scale equilibrium bedforms. Longitudinal bars are usually formed during rising stage when bedload transport is greatest and the river's competence is highest. However, the ultimate shape of the bar is, in part, dictated by falling stage flows when the bar is dissected and modified. In braided rivers dominated by sand-sized bedload, the longitudinal bars give way to transverse or linguoid bars. These bars are tabular in shape, with their long axis perpendicular to the dominant current and sediment transport direction. Composed entirely of sand, transverse bars migrate by accumulation of sediment on the lee face and on the sides, causing them to expand laterally as well as in the downstream direction. Numerous studies have shown that there is a general continuum of river channel morphologies from straight to meandering to braided. With acknowledged scatter in the data, most workers recognize that the pattern is dependent primarily on differences in discharge, channel slope, and sediment load (table 4.1). As noted above, bankfull discharge appears to be the discharge level most responsible for the shape of channel cross sections. The same appears to apply to braiding versus meandering behavior. A comparison of channel slope to bankfull discharge differentiates meandering from braided rivers (fig. 4.15A): braided rivers dominate high bankfull discharge/high slope settings; meandering rivers dominate low slope/low bankfull discharge settings. Since channel cross section and both meandering and braided river behavior are also dependent on the transport and deposition of bed material, it is logical to assume that the patterns should be related to the amount and size of the bedload material as well. As shown in figure 4.15B, the relationship between total sediment load of a river and its slope defines the changes from straight to meandering to braided morphologies. Intriguingly, researchers have been able to mimic the development of straight, meandering, and braided channels in flume experiments. Their research shows that the transition between these channel types is not gradual, Rather, thresholds appear to be reached which cause a rapid realignment of the river channel to its new morphology. California's rivers exhibit virtually all types of channel morphology and pattern. Rivers with high gradients and highly variable discharge carrying exceptionally coarse bedloads are common in southern California and the desert areas. Where not confined by bedrock canyons, these rivers have braided channel patterns. Of course, most of these rivers (like the Los Angeles River) are now polluted concrete-lined ditches. At the time of the first settlements, however, the river channels were braided and contained numerous active and inactive channels that ran primarily during the winter. Other prominent examples include rivers like the Santa Ana and the Santa Clara. Both have highly braided channels where they have not been channelized by public works projects. Meandering is the norm in northern California, where runoff conditions are somewhat more stable and the major rivers are dominated by a finer-grained sediment load. The Sacramento and San Joaquin rivers are the prime examples of meandering rivers. Again, channeling has greatly altered the original pattern of these rivers, but major portions still retain the very high sinuosity that dominates the lower reaches of these types of rivers. All of this discussion about the controls on the formation of straight versus meandering versus braided rivers assumes that the river establishes itself within an alluvial valley that is large in comparison to the actual river channel. In areas that are undergoing rapid rates of uplift, rivers like the upper reaches of the Kern, Kings, and Tuolumne will typically incise deep canyons. Because of the rapid downcutting of these canyons, the rivers establish relatively narrow and localized alluvial plains separated by long stretches where the river is confined primarily to a gorge. Thus in plan view, major portions of the rivers may actually be classified as "straight" or "sinuous" even though they have very high slopes, high bankfull discharge levels, and high total sediment loads. The overall channel pattern of these upland rivers should be considered separately from their lowland counterparts in that the pattern is strongly influenced by the geology, rate of uplift, and associated rate of incision. With the exception of the Tulare Lake basin and other enclosed basins, most of the runoff of California's rivers makes it to the Pacific Ocean. In the absence of sediment traps like dams, the sediment should also have the sea as its ultimate destination. Where the rivers meet the sea (or any lake, for that matter) and lose almost all of their competence and capacity, they rapidly dump their sediment, forming a localized accumulation of material right at the ocean/river join. The contiguous mass of sediment deposited at the mouth of a river is referred to as a delta, a term first used by Herodotus, who noted that the accumulation of sediment at the mouth of the Nile broadly resembled the symbol delta (Δ) in plan view. Because much of the oil and gas of the United States comes from ancient deltaic deposits, there is a vast literature on the accumulation of sediments and the flow of currents within deltas. Most of the work focuses on deltas like the Mississippi, where high sediment influxes and weak oceanic currents allow the accumulation of vast quantities of sediment that rapidly extend the delta seaward. Because the oceanic currents that sweep the coast of California are so vigorous, they are capable of eroding and transporting most of the sediment delivered by the rivers. This is why rivers like the Eel, Mad, and Klamath, which have exceptionally high sediment loads, have not built extensive deltas. The only places where typical deltas like the Mississippi's are able to establish are where ocean currents are relatively weak, which allows sediment to accumulate. The only significant "delta" in California occurs at the confluence of the Sacramento and San Joaquin rivers (figs. 4.16, 4.17). Since it is fully 50 miles from what we would normally call the coast of California, by most standards the Sacramento/San Joaquin Delta cannot be considered a true delta. It is really an accumulation of sediment at the headwaters of a very large estuary. The San Francisco Bay/Delta estuary was formed by the rapid Holocene rise in sea level and the drowning of the river that once flowed through what is now San Francisco Bay. The shape and location of the present delta, which is controlled largely by uplift of the Coast Ranges near San Francisco, has little in common with deltas seen elsewhere in the world. Although it looks little like a true delta, the behavior and morphology of the river channels that transport sediment and water through the Sacramento/San Joaquin Delta are, at least on a local scale, very similar to deltas worldwide. As the meandering, single channel Sacramento and San Joaquin rivers enter the delta region, the sharp decline in gradient or slope causes the channels to bifurcate, forming a complex meshwork of channels or distributaries that split and merge repeatedly (fig. 4.16). This distributary channel network is created by three general processes. First, channel bifurcations can take place where channels essentially clog due to accumulation of material, such as at channel mouths. Second, bifurcations can form when distributary channels flood, breaching their own natural levees and eventually establishing a new channel. Termed crevassing, this process is the most common mechanism of channel bifurcation in deltas. Finally, flow within the delta is not entirely downhill. Large tidal fluctuations cause water to literally back up in the channels closest to the bay, increasing overbank flooding and overall channel instability. The net result of these processes is the production of a lacework of anastomosing channels that split and join around organic-rich islands. Fig. 4.17. 1972 aerial photograph of delta near confluence of Sacramento River (above) and San Joaquin River (below) illustrating anastomosing channel network. Photograph from W. L. Kahrl, The California Water Atlas (Sacramento: Governor's Office of Planning and Research, 1979). In the absence of human interference, the channels of the delta would be highly ephemeral, switching constantly, eroding islands and forming new ones, flooding and depositing fine sediment in large tracts between channels, and supporting what is widely recognized as the richest ecosystem in the state. The man-made levees that line virtually all of the channels within the delta have "frozen" channel migration within it. In addition, farming practices that promote the oxidation of peat-rich soils within the delta have caused widespread deflation and lowering of the islands. Today, many of the islands lie well below sea level. These changes, coupled with the extensive pumping associated with the Central Valley Project (CVP) and the State Water Project (SWP), have altered and severely damaged the delta's overall plumbing system, forming a political and land use headache for all of California (chap. 16). Most of the work that a river does is conducted within its channel. The channel cross section and the plan view pattern of channels reflect the balance of energy expenditures by a river as it handles its load and discharge. The overall shape of channel cross sections is presumed by many geomorphologists to be controlled by the relatively frequent bankfull stage events coupled with the nature of the bank materials. Suspended load-dominated rivers tend to have fine-grained, erosionally resistant banks, which lead to the formation of steep-walled, narrow channels that are more efficient at moving material in suspension. Bedload-dominated rivers have bank materials that are primarily made up of coarse-grained, less cohesive sediment. Channels established in these materials tend to be wider and shallower. The plan view pattern of river channels reflects a river's attempt to maximize energy efficiency while balancing energy expenditures over its length. Two general types of river patterns occur: single channel and multichannel. Single channel rivers occupy a relatively stable main channel. The morphology of single channel rivers varies from straight to sinuous to meandering. The development of sinuosity in a river takes place as secondary circulation cells develop within a channel. These cells create localized scouring (pools) and deposition (riffles), depending on whether flow cells converge or diverge within the channel. Once established, riffles and pools accelerate the lateral migration of channels by enhancing lateral scour. In particular, meander bends develop adjacent to pools due to intense scouring of the channel wall. Point bars develop on the inside portion of meander bends where helical flow allows accumulation of sediments. Meanders are commonly abandoned as channels migrate, creating oxbow lakes and sloughs. The sinuosity of a single channel river and the wavelength of the meanders appear to reflect the magnitude of bankfull stage conditions. Multichannel rivers develop numerous shallow, broad channels that bifurcate and join repeatedly, thereby forming islands. The development of numerous channels appears to reflect a river's efforts to dissipate excess energy and transport an exceptionally coarse load. The braided river channels are highly unstable due to the growth and migration of longitudinal and transverse bars. The bars grow to eventually form islands, which deflect flow, forming new channels. In addition, coarse-grained bank materials are less resistant to erosion, which promotes channel instability. The type of channel pattern and sinuosity is generally dependent on the slope, discharge, and sediment load of a watershed. Meandering rivers are favored in settings characterized by steady discharge, low slope, and low, fine-grained sediment loads. In contrast, multichannel rivers are common in watersheds with highly variable discharge, high slopes, and coarse, voluminous loads. The Sacramento/San Joaquin Delta is the interface between two meandering rivers and the San Francisco Bay estuary. The delta contains a meshwork of channels that wrap around low-lying islands. The loss of stream power within the delta causes channels to aggrade, promoting channel bifurcation. Crevassing during flood stage also causes channels to bifurcate and join neighboring channels. Channel instability is enhanced by the effect of tides that reverse flows in some channels and increase the elevation of flows within others. Best, J. L., and C. S. Bristow, eds. 1993. Braided Rivers. Geological Society Special Publication no. 75. London: Geological Society. Elliott, C. M. 1984. River Meandering. Proceedings of the ASCE Conference on Rivers 1983, New Orleans, 24-26 October 1983. New York: American Society of Civil Engineers. Gregory, K. J., ed. 1977. River Channel Changes. New York: John Wiley and Sons. Ikeda, S., and G. Parker, eds. 1989. River Meandering. Water Resources Monograph no. 12. Washington, D.C.: American Geophysical Union. Keller, E. A. 1972. "Development of Alluvial Stream Channels: A Five-Stage Model." Geological Society of America Bulletin 82: 753-756. Keller, E. A., and W. N. Melhorn. 1974. Form and Fluvial Processes in Alluvial Stream Channels. West Lafayette: Purdue University Water Resources Research Center. Knighton, D. 1984. Fluvial Forms and Processes. Baltimore: E. Arnold. Leopold, L. B. 1994. A View of the River. Cambridge: Harvard University Press. Leopold, L., and M. G. Wolman. 1957. River Channel Patterns: Braided, Meandering, and Straight. U.S. Geological Survey Professional Paper no. 282-B. Mangelsdor, J., K. Schuermann, and F.-H. Wei\s8\. 1990. River Morphology: A Guide for Geoscientists and Engineers. Berlin: Springer Verlag. Miall, A. D. 1977. Fluvial Sedimentology. Calgary: Canadian Society of Petroleum Geologists. Morisawa, M. 1985. Rivers. New York: Longman. Richards, K. S. 1982. Rivers: Form and Process in Alluvial Channels. New York: Methuen. _____, ed. 1987. 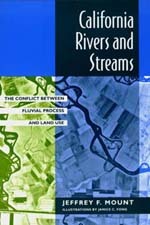 River Channels: Environment and Process. New York: Blackwell Scientific Publications. Schumm, S. A., and H. R. Kahn. 1972. "Experimental Study of Channel Pattern." Geological Society of America Bulletin 83: 1755-1770. Thorne, C. R., J. C. Bathurst, and R. D. Hey, eds. 1987. Gravel Bed Rivers. New York: John Wiley and Sons. Warner, R. E., and K. Hendrix, eds. 1984. California Riparian Systems. Berkeley, Los Angeles, and London: University of California Press. California Rivers and Streams provides a clear and informative overview of the physical and biological processes that shape California's rivers and watersheds. Jeffrey Mount introduces relevant basic principles of hydrology and geomorphology and applies them to an understanding of the differences in character of the state's many rivers. He then builds on this foundation by evaluating the impact on waterways of different land use practices—logging, mining, agriculture, flood control, urbanization, and water supply development. Water may be one of California's most valuable resources, but it is far from being one we control. In spite of channels, levees, lines and dams, the state's rivers still frequently flood, with devastating results. Almost all the rivers in California are dammed or diverted; with the booming population, there will be pressure for more intervention. Mount argues that Californians know little about how their rivers work and, more importantly, how and why land-use practices impact rivers. The forceful reconfiguration and redistribution of the rivers has already brought the state to a critical crossroads. California Rivers and Streams forces us to reevaluate our use of the state's rivers and offers a foundation for participating in the heated debates about their future. Jeffrey F. Mount is Professor of Geology at the University of California, Davis. Janice C. Fong is Principal Illustrator in the Department of Geology at the University of California, Davis. 14. A Primer on Flood Frequency: How Much and How Often?